Here we are for another GIT (Goddess in Training) post, in which I try to figure out how to, you know, live. I’m totally standing by what I said about how I was into the traditional publishing thing to learn stuff. And I was lured by the possibility of an advance. But something I didn’t talk about: it seemed easier. Once I made the decision to go that way, I immediately felt less pressure. Sure, traditionally published writers absolutely have to work to market their books, but it seemed like I would at least have some help and guidance in that regard. More than that, it was the traditional publishing schedule that was appealing. In indie it’s definitely a good idea to put out as much work as fast as you can. So the idea of only being able to put out one book a year for a while, and being okay with doing only that if I wanted, was appealing. It was a relief to think that I might be able to write one manuscript a year and let other people deal with the details, and to feel like I wouldn’t be the sole person in charge of my own destiny with regard to marketing. Now that I’ve gone back to indie, of course all that pressure’s back, along with more because I was such a slacker for months while I was finishing Heroes ‘Til Curfew. I spent the weekend redesigning my site here, revamping some of the static content. I’ve got a bunch of ideas for things I want to do and try, and mostly it’s just stuff I want to do better. Stuff I’m letting slide because I spend a lot of time worrying instead of just buckling down and taking care of things. And the worst part of THAT? One of the things that doesn’t get done is writing the next book. Right now I am RIGHT where I was last year in terms of not writing consistently because I’m constantly doing this #HeadlessChicken act. My stats sickness is a little better this year. Which is good. Maybe I’m in recovery. On the other hand, I’m busier in my personal life. My daughter started a dance class this year, I’ve got four different social commitments which actually take me out of the house 6-12 times a month (this is a lot for me). Scariest of all, I’ve got a Girl Scout Brownie troop I’m going to be leading this year. We’re supposed to have our first meeting on Friday, stuff’s not in place for that yet, and I have about a million details to take care of. I’m conscious of kind of freaking out here. So somewhere in the middle of being better about keeping house (which was destroyed by two seven-year-olds having a sleepover this weekend), being better about family meals, being better about fitness (my back is killing me and I think it’s because my muscles are too weak to hold me up properly because all I do is sit in front of this computer), being better about social media, figuring out the Girl Scout details, remembering dance class and the other stuff on my calendar, I have this vague recollection that I’m supposed to be writing a book–if I ever want to get anywhere in this career, and while I’m at it, there’s a short story and novella I need to write before that book comes out. Not to mention that idea I’m supposed to come up with for my agent for something different. However, at some point in the past, I used to write more, I used to read more, and I had a baby who nursed hourly and then an insane toddler who had to be watched every moment and never napped. And somehow I also got housework done, served a lot more from-scratch food than I do lately (including homemade baby food), and somehow had time to maintain a personal blog and socialize on LJ all the time. One thing that I had at that time was a control journal–a domestic’s day-planner. I had a page for every day of the week and all I had to do every morning was open it up. All my routines were written out so that I didn’t have to think, I just had to do and cross things off. And of course, after some time of doing these routines, they actually became routines. But having it written down allowed me to be on autopilot before I actually learned the route. You can see on one side were some of the things I was supposed to daily. There as a place to write in stuff specific to that day–like sending my brother a birthday card–and a place for writing in tasks which weren’t daily or weekly. This page’s notes tell me to finish one of the slipcovers I was making and to declutter the entertainment center. I’d write all those things in when I organized for the week on Sunday. On the other side of the notebook is my dinner menu for the day with recipes, in the order they had to be started. So the crockpot recipe was first, bread recipe for the bread machine next, and quick fix vegetable sides at the end. I realize that I spend a lot of time spinning my wheels because I’m so stressed about not having stuff done that I can’t think what to do next. So I don’t actually DO anything, so I get more stressed. And I think I can really point to things falling apart when I moved from that last house to this one. My routines were upset because things were different and I stopped using the journal. So I’m going to be working on building a new control journal for myself. Or perhaps a few of them. I need to keep track of stuff for the house, stuff for the writing job, stuff for Girl Scouts. I’m not going to stop everything to try to make the perfect journal all at once. I’m just going to start writing things down, collecting data, putting it together a little a time. If you’d like to read more about control journals, click here. Well, I stayed up until midnight last night, but was so tired I forgot to check my numbers before they went away. So now I’ll have to wait until the reports come up to see how I did in December. So I guess I’ll be putting off my look back at the year for a few days. Which is cool. This frees me up talk about what I want to do this year. Really work at least an hour each weekday (30 min. ALONE) on real work. Not blogging, or any other kind of marketing, and calling that book work. If I don’t get work done during the day, I need to make up the time after everyone goes to bed. Complete and release Heroes ‘Til Curfew, the short story about what happened when Joss got home at the end of Hush Money (needs title that’s shorter than that! ), possibly another short story, and a full-length book 3 novel. Do some real work on outlining the series. 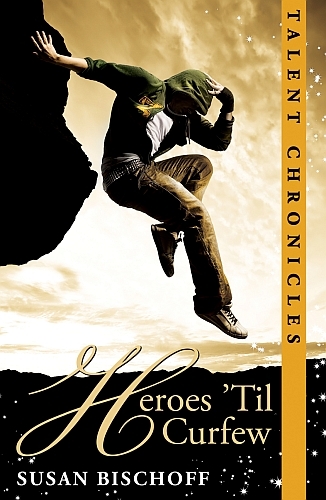 Write at least 3 scenes per week until the draft of Heroes ‘Til Curfew is finished. Complete 1 scene per weekday on the next book. Get back in the habit of sitting down and writing a complete thought. Work out a schedule to post at least three days a week. Write at least one regular post a week that might interest non-writing visitors. I actually have no idea what it is to be a non-writer, or what interests non-writers. If anyone’s got topic suggestions, I’d love to hear them. I need to get back to having time for other things in my life. I want to get back to my doll hobby. I’ve got several dolls that need their faces painted and other maintenance. I want to get back to sewing and patternmaking. I enjoy that and I want to find the time to create and publish patterns again. Exercise. While hardly a hobby, ew, I don’t want to give it its own category. So I’ll put in here with things to make time for. I just need to make sure I get up and do some little thing every day. And we’ll see where that leads. I got an indoor bike trainer for Christmas, so maybe I’ll be able to combine exercise with reading this year. I used to be pretty into Flylady, which was a huge help to me. I’ve really slacked off on that since my daughter started school and I’ve turned my attentions toward creative pursuits. What lunch used to look like before Hush Money. Get back to regular menu planning because getting the cooking/shopping stuff under control always makes things run more smoothly. I’ve got some great recipe management software now, so I should be able to make this not so much of a chore. Make this the year I get rid of all the excess crap. I’ve still got most of my daughter’s baby clothes and toys. I’ve got tons of fabric and yarn I’ll never use. I’ve got mountains of paper books that will never be read again (and as most of them are too old for the used bookstore, I’ve no idea what to do with them). 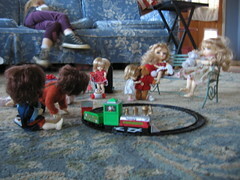 Even the little dollies got presents in 2009.
fabulous Christmas, but I usually do a lot better than this. I usually put away a little cash out of my grocery money every week all through the year and then have most of my gifts purchased by November. I usually give lots of gifts of homemade cookies. None of that happened this year. Nor did I send any cards. In previous years I’d done the Holiday Grand Plan, and I’d even run the LJ community for it for the last few years. Since it starts at the end of August, right when I was into marketing Hush Money, learning a ton of new stuff, trying to get the print version out, etc, I turned the running of the group over to someone else and didn’t participate. And when Christmas came around I could really feel the difference. So this year I need to get back on that wagon and make this Christmas better and less stressful at the same time. If you’ve read this far, you’re pretty awesome (and possibly really bored). Thanks for hanging out with me while I think through my life. This probably looks like a lot, but I don’t think there’s anything new here, or anything that’s not what I already feel I need to be doing. It’s just working out how to be more consistent with all of it that’s a problem for me. Organization. Maybe my real intention is to stop being my own worst enemy. Help me help you, Susan.